If you are a homeowner, business owner, or contractor in Belton TX and are looking for a good Belton dumpster rental company to get a roll off dumpster from then Hook N Haul Dumpsters is the company to call. Customer service is our priority on every dumpster rental drop off and pick up that we do and our reviews show it. We have become the premier dumpster rental service of Belton because we have the most affordable prices for roll off dumpsters and we offer same day dumpster rental service. We are a local dumpster rental service that has a phenomenal team of drivers and a healthy stock of roll off dumpsters of all sizes to ensure we can get you the right size when you need it. We have large dumpster rentals in belton that can handle full home remodeling projects or big roofing jobs. Our large dumpster rental sizes in Belton are the 30 yd dumpster and 20 yd dumpster rental which are the more popular sizes to rent from contractors, home builders, apartment complexes, or business owners. When deciding to go with our large dumpster rental sizes you must make sure that you have the space for us to come and make a drop. These dumpsters are the more popular roll off dumpsters so don’t hesitate and fill out a form quickly to reserve your dumpster rental today, and if you have questions on it just call us at 512-876-0271. Our small dumpster rental Belton comes in handy for those smaller type jobs like a garage clean out, small remodeling jobs, landscaping work, ect. Our small dumpster rental sizes are 10 yd dumpsters and 12 yard dumpsters These are perfect for homeowners needing a dumpster rental in belton for a home project because they are the right size to fit in most driveways. If you have questions about the size of roll off dumpster you will need for your job just call us today at 512-876-0271. We offer a variety of Belton dumpster rental sizes and sometimes it can confuse our customers as to what size roll off dumpster they need for their project. Choosing a dumpster size is not an exact science, but that’s where experience comes in. 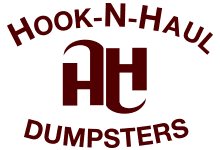 Hook N Haul Dumpster Rental professionals can discuss your project and recommend an appropriate sized dumpster for your project. Here are some specifications and broad guidelines for each dumpster size we provide. 10 yard dumpster is usually appropriate for small remodeling projects and medium sized clean up projects. 12 yard dumpster is a dumpster that still is driveway friendly but offers that extra room you may need past what the 10 yd dumpster offers. 20 yard dumpster is going to be considerably longer than a 10 yarder. 20 yard dumpsters are generally best for medium sized renovation projects and large home clean up projects. 30 yard dumpster is going to have considerable higher walls than a 20 yarder. 30 yard dumpsters are generally larger than what is necessary for any but the largest home cleanout projects, the are generally used for larger remodeling and renovation type projects. With the different choices of dumpster rental sizes sometimes it can leave our customers in Belton TX, feeling overwhelmed as to which size of dumpster they need for the project or job they have. If you have questions about the size of dumpster rental you need the best decision is to always choose a size up to ensure you don’t load the dumpster past the weight capacity or just call Hook N Haul dumpsters to ask us what size we recommend based on the type of job and amount of waste you have.